To me, chicken pot pie is a classical American comfort food and oh so delicious. I remember enjoying it as a kid on a chilly fall evening with my family. 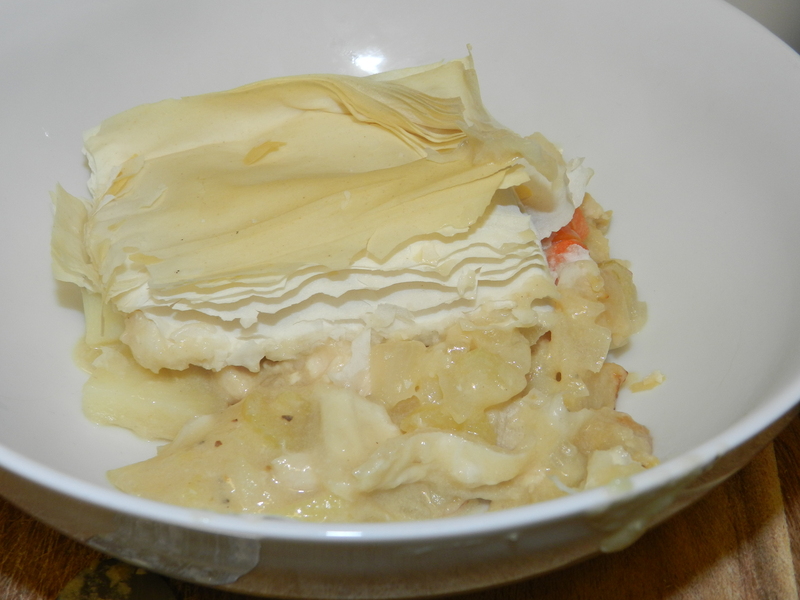 Knowing what I know now about nutrition, your classical chicken pot pie is filled with salt, butter, and white flour …. not the best things for you. So I decided I needed to find a healthier way to enjoy this American favorite. My good friend, Joelle, makes a mean chicken pot pie with an unbelievable golden crust. 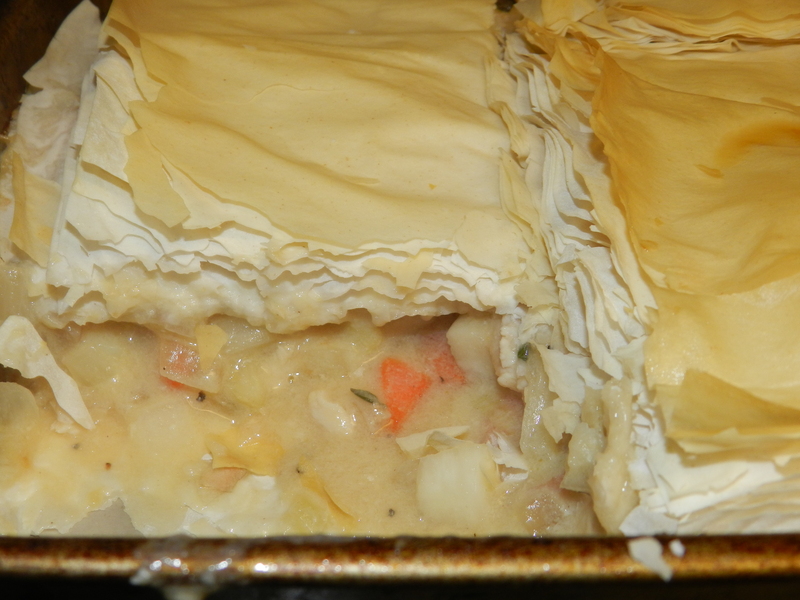 I knew going into my search for a recipe that I wouldn’t be able to replicate the amazing crust and accomplish my goal of creating a healthier version of chicken pot pie. But I think this version comes pretty close! You can still enjoy this traditional comfort food without killing your waist line and consuming lots of calories on the process. I know this isn’t considered a “summer” meal, but the last few nights have been a little chilly and who doesn’t enjoy chicken pot pie any night of the week. I was seriously craving some comfort food! This recipe makes enough for a family of 4-6 and keeps well for left-overs the next day. If you have kiddies, they will love this meal and have no idea it is low in fat and good for you! My husband eats like a teenage boy and gobbled this up! Preheat oven to 350F. 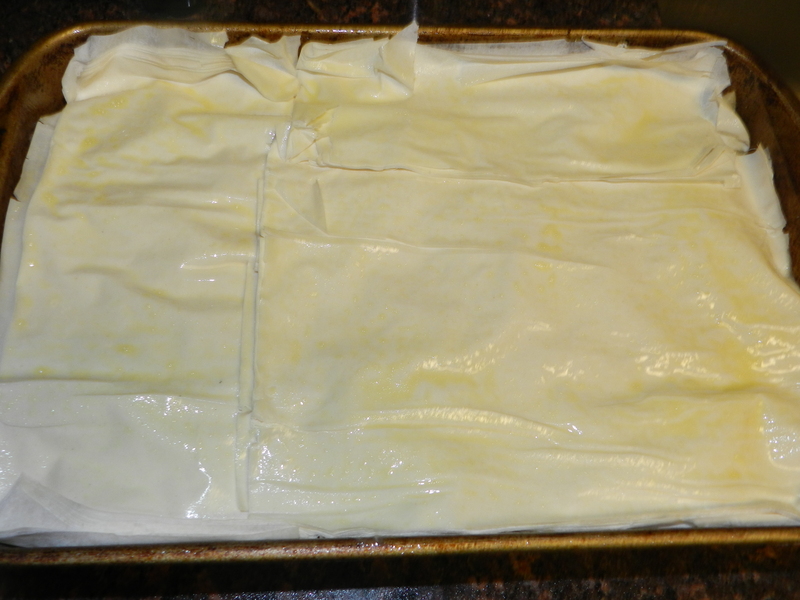 Thaw 6 sheets of phyllo dough overnight in the fridge or an hour before using. 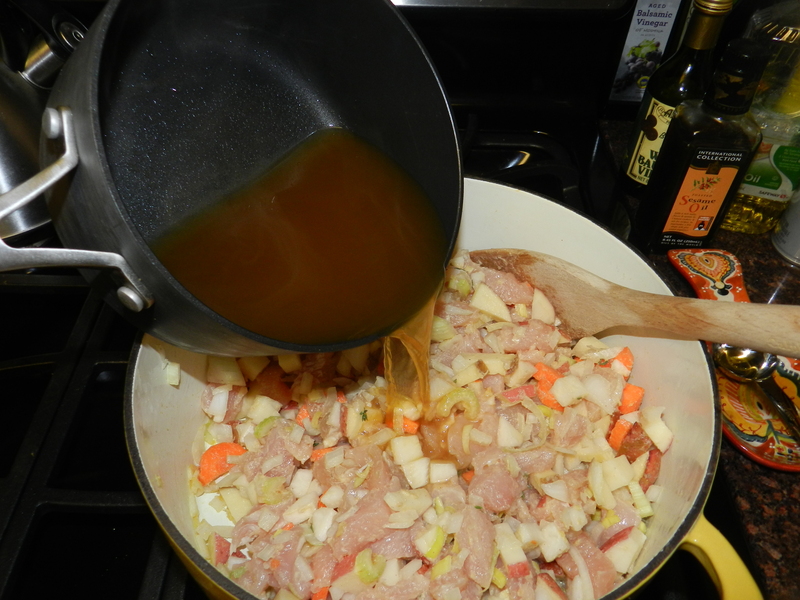 Bring the chicken stock to a simmer and keep warm. In the meantime, cut up all the vegetables and place in a bowl. In a big pot, add olive oil and flour and cook until lightly golden, about three minutes on medium heat. 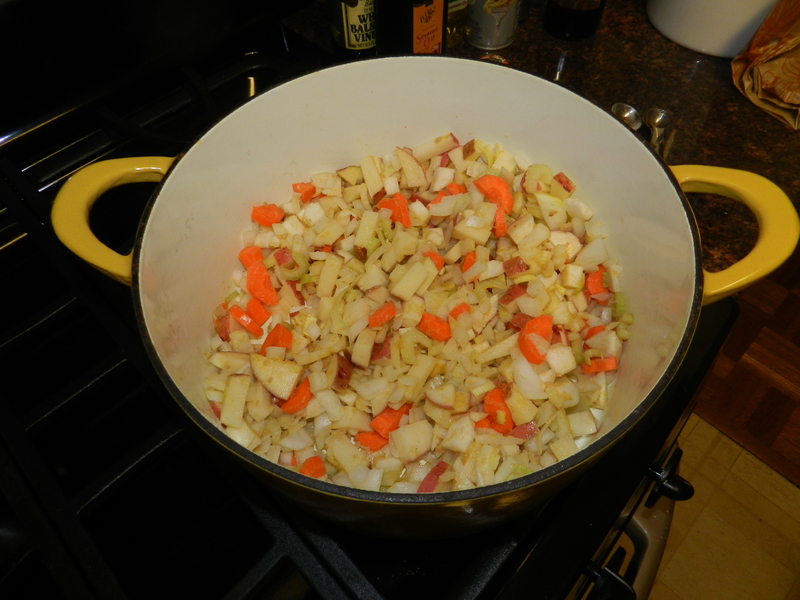 Add the onion, garlic, leek, carrot, celery, red potato, and turnips and stir with a wooden spoon, making sure the bottom does not get too dry. Next, dice the chicken and add to mixture. Add bay leaf and thyme sprigs. Continue stirring for about 3 minutes, so that everything is coated with the flour mixture. Add the warm chicken stock, stir and scrap the bottom of the pot to get all the color into the mixture and keep it from scorching. Bring to a boil then lower to a simmer. 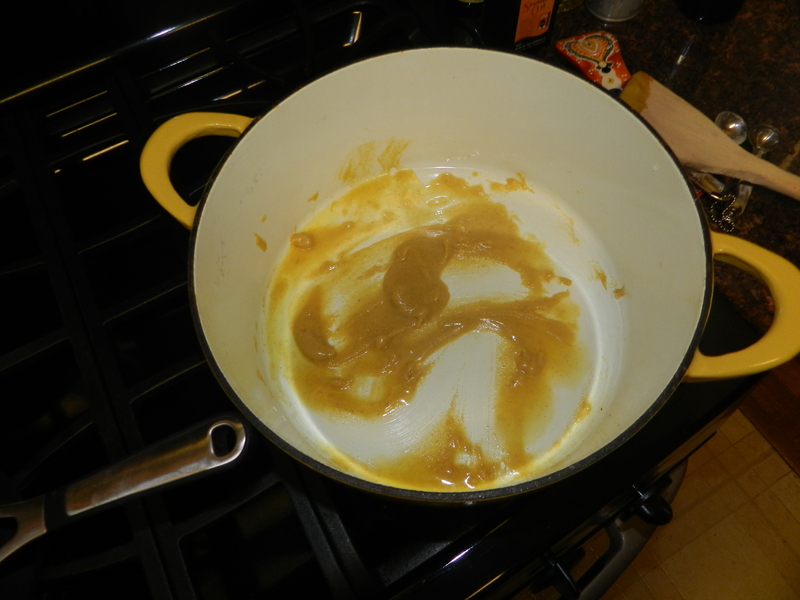 Let the mixture simmer, covered, for another 5-7 minutes until it becomes thick and the chicken in opaque. Remove from heat and reserve. 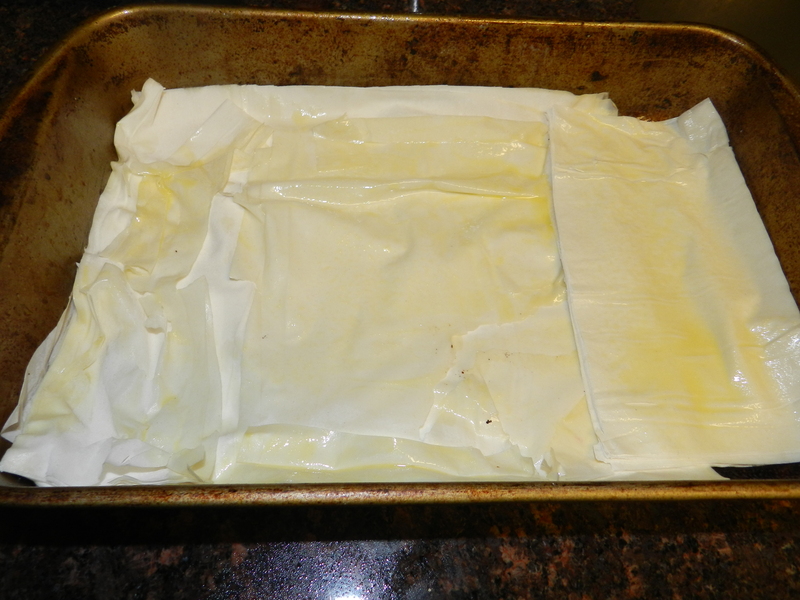 While the mixture is simmering, take 6 sheets of phyllo dough and, with a knife, cut out a square ( or rectangle depending on the size of your pan) slightly larger than the size of your pan and brush or spray with olive oil. Place on bottom of an oiled pan. 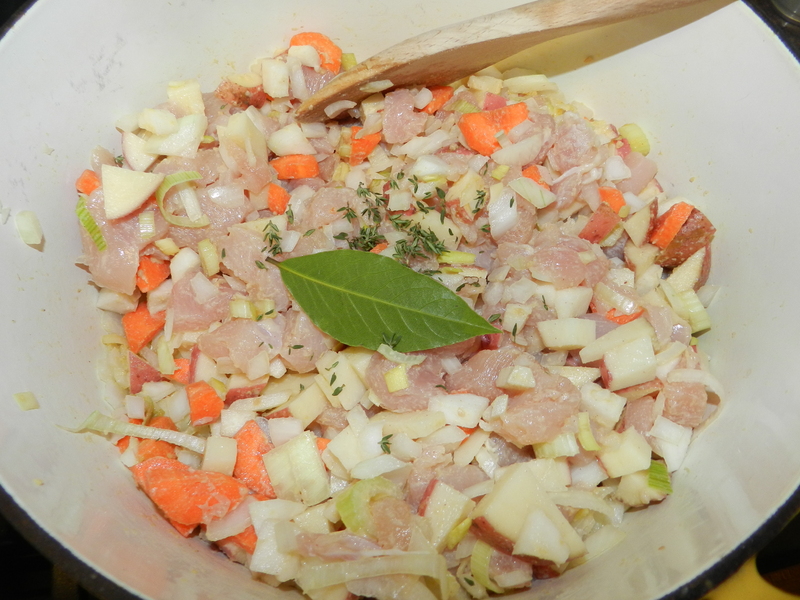 Remove the bay leaf and thyme sprigs from the mixture. Add salt and pepper. 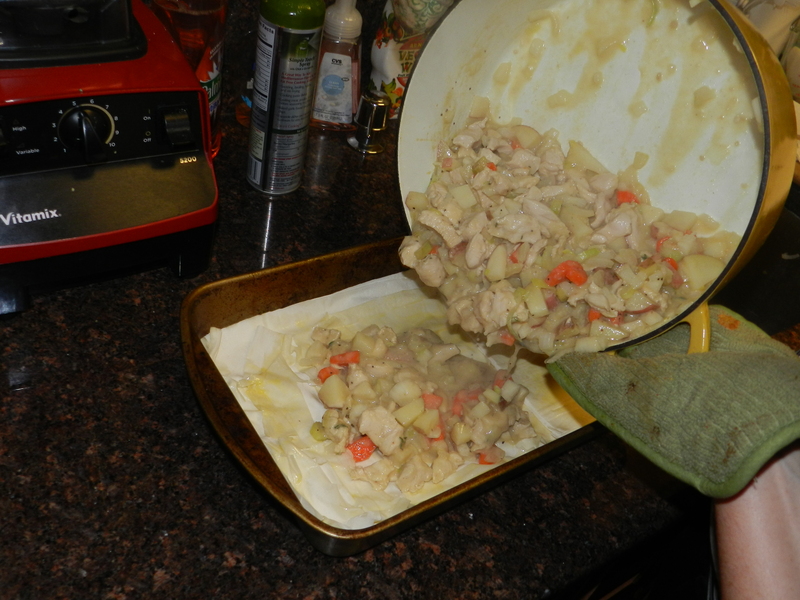 Add chicken mixture to pan. 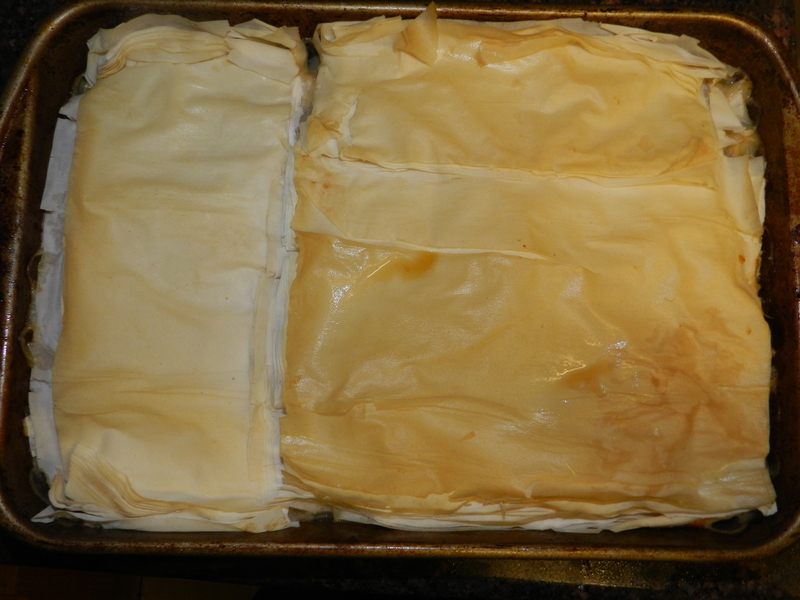 Take remaining phyllo dough and cut enough to cover the top of the chicken mixture. Gentle press with your hands and spray with olive oil. Bake in the oven for 30 minutes. Using the phyllo dough cuts back on the calories of your traditional chicken pot pie and saves you time in the kitchen as well! Enjoy! This entry was posted in Food, Uncategorized and tagged chicken pot pie, healthy comfort foods, healthy living, healthy recipes by find your healthy haven. Bookmark the permalink.